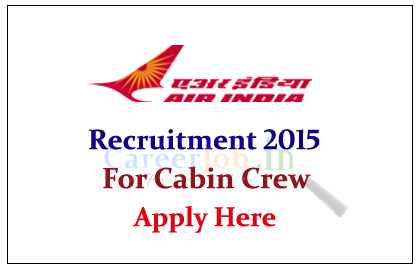 Air India limited is recruiting for post of Cabin Crew for the year of 2015 in several regions. Interested and Eligible candidate can apply here on or before 18th June 2015. Airline Allied Services Limited, a wholly owned subsidiary of Air India Limited, is looking for smart, young and energetic "Unmarried" Females& Males, Indian Nationals for its immediate requirement of Cabin Crew on Fixed Term Engagement, for a initial period of Five years in Northern, Eastern, Western and Southern Regions as mentioned below or at any other stations depending upon the requirement and to maintain a wait list for future requirements. Rs.600/- in favour of AIRLINE ALLIED SERVICE LTD payable at NEW DELHI. Eligible Candidates, who fulfil the above requirements, may apply ONLINE (ONLY). Candidates who wish to apply, are advised to log on to Careers page of Website : www.airindia.com and fill in the Online Application Format on or before 18.06.2015, For more details kindly check official Notification.